Just in case her budding career as a blueberry-smashing chair climber doesn’t pan out, young Grace Young is honing her skills and enhancing her early proclivity for modeling. Check out this first shot in her portfolio: see how she gazes into the distance, completely unperturbed by the flash and snap of the camera? She’s so comfortable with the camerawoman, it’s like she eats, sleeps, lives and breathes with her 24/7. Sometimes on her, truth be told. Feeding the leppie calves with windblown hair. 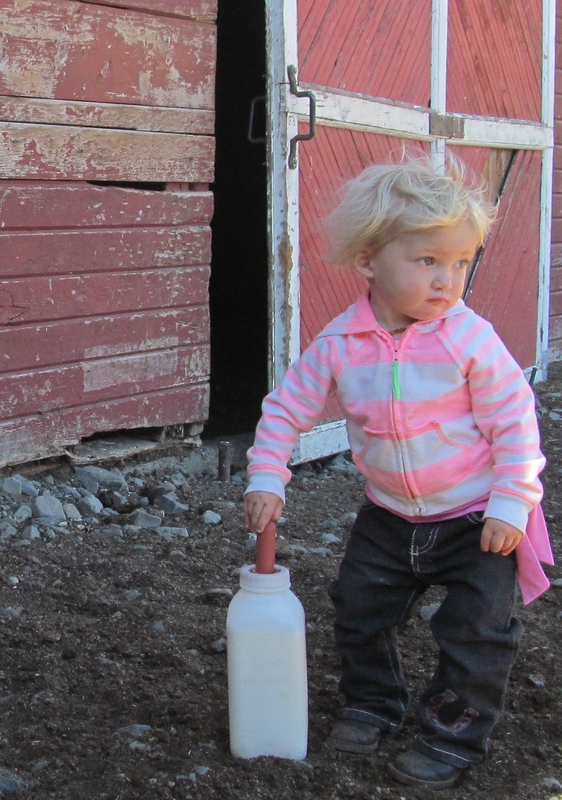 She wasn’t feeding the leppie calves windblown hair…she was feeding them milk replacer, while she had windblown hair. Just thought I’d clarify. In this next shot, the ranch cavvy can be seen in the background at the historic Alvord Ranch barn in southeastern Oregon. Miss Young is looking the opposite direction, feigning that horses aren’t her favorite animal and that she doesn’t really REALLY want to go sit on Shorty’s bare back. She’s already such an actress. Cap by Pretty Westy; sweater, jeans and boots from Big R, courtesy of Grandma Bev and Grandpa Jim. Pout by Grace Young. Gazing away from the cavvy, because she’s too cool to look at her favorite horse, Shorty. Here she is with her signature patent-pending Scrunchy Face look. 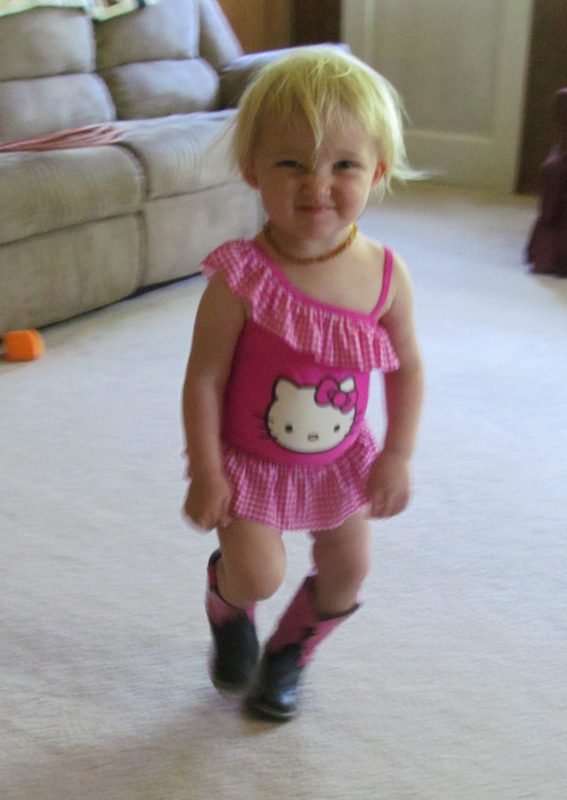 Grace is showing off one ensemble from the Summer in the Sticks collection: a Hello Kitty swimsuit, Old West boots which may or may not be on the correct feet, and an amber teething necklace. Hurry and get your outfit purchased before stores run out. 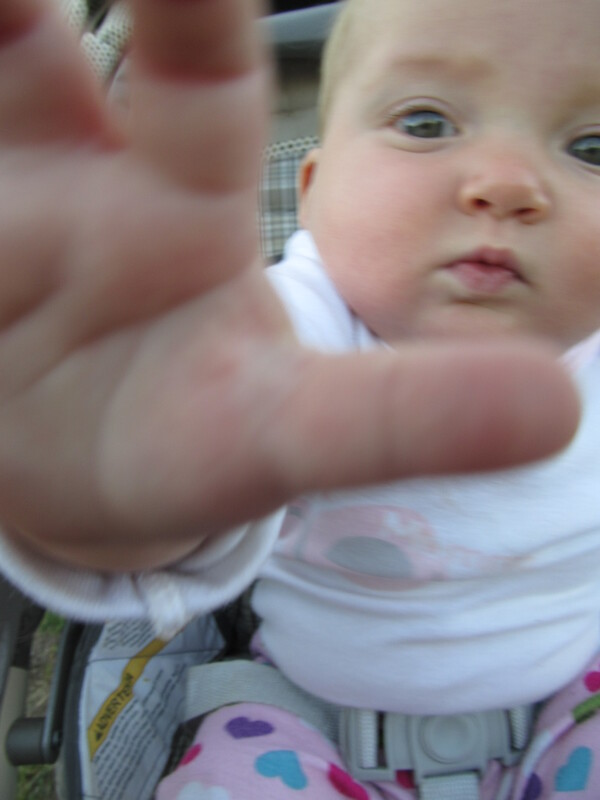 “I scrunch my face at you because I love you, Camera Person/Mom.” At least, that’s what I tell myself she’s thinking. 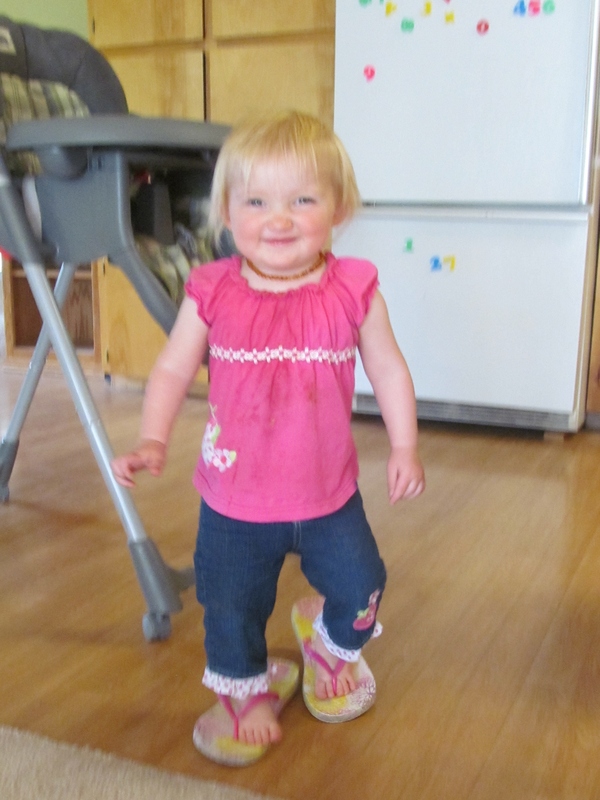 Below, Grace models her mom’s sandals and her own cheesy grin. A favorite activity is stuffing her little feet into the shoes and boots of her mom, dad, visiting cowboys/neighbors/grandparents and shuffling around the house. 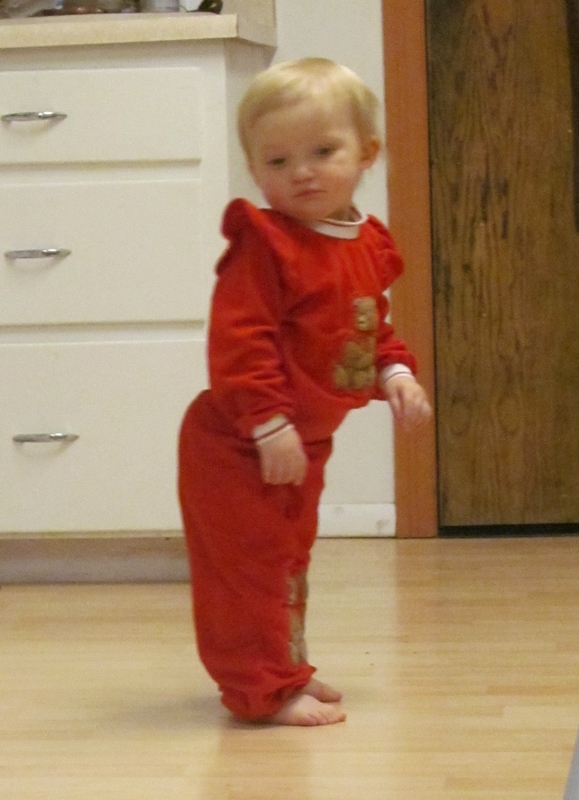 This morning, she tried to “wear” her dad’s insoles around the kitchen. She was doing great, until she tried to walk. Cutest little shoe thief west of the Mississippi. 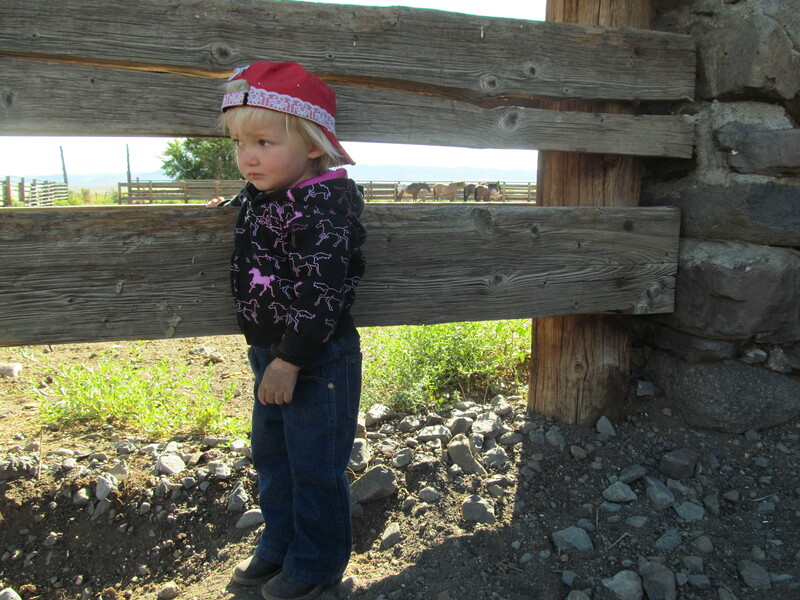 Since the tot moved to southeastern Oregon, land of the single-rig saddle, 6-year-old snaffle bitter and 90-foot poly ropes, Grace decided to model a local style. 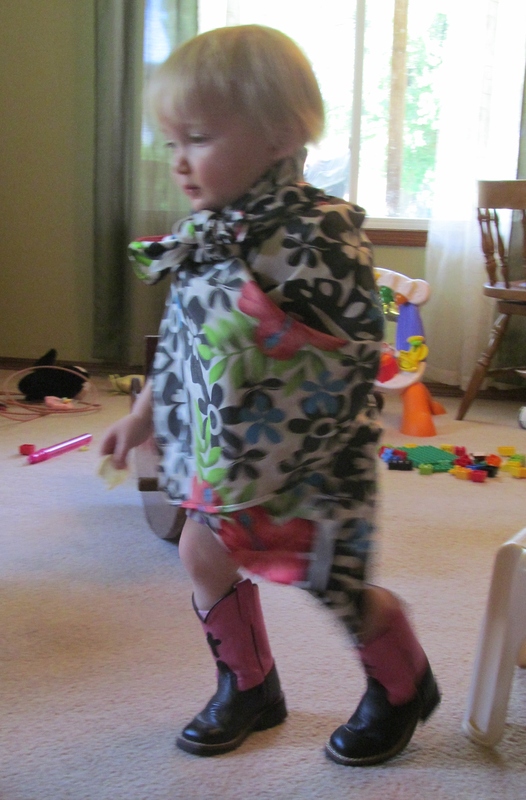 Here, she’s sporting a pair of pink and black boots and a gen-u-wine buckaroo wild rag. Boots by Old West, silk wrap by unknown artisan. Please note she’s demonstrating the proper wild rag knot used by working cowboys: the square knot. Below, 13-month-old Grace models her second cousin Katie’s vintage baby clothes, handmade by her great-aunt Kristine in 1981. (Sorry, Katie, I just outed your age!) The handcrafted garb was perfectly constructed with ruffled accents and appliqued bears, but the polyester fiber was a bit, um, hot. 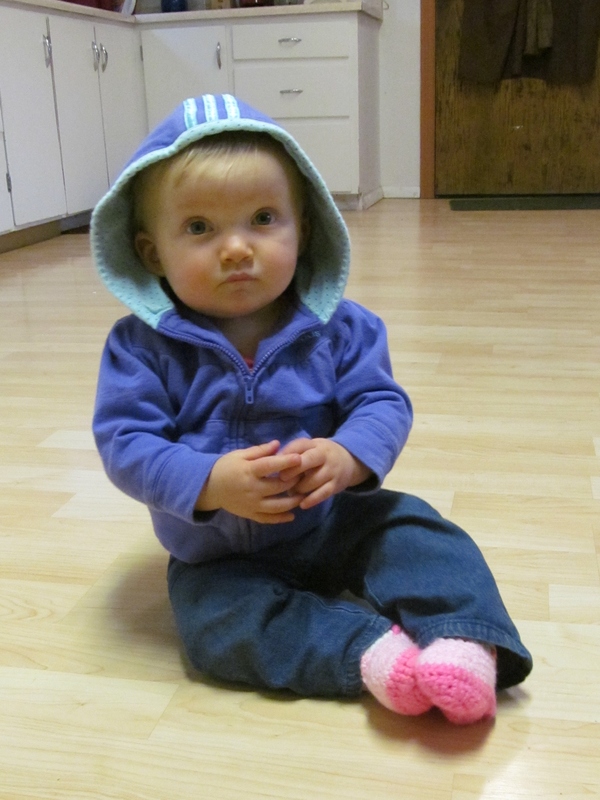 A tot’s modeling portfolio wouldn’t be complete without a dipe shot. 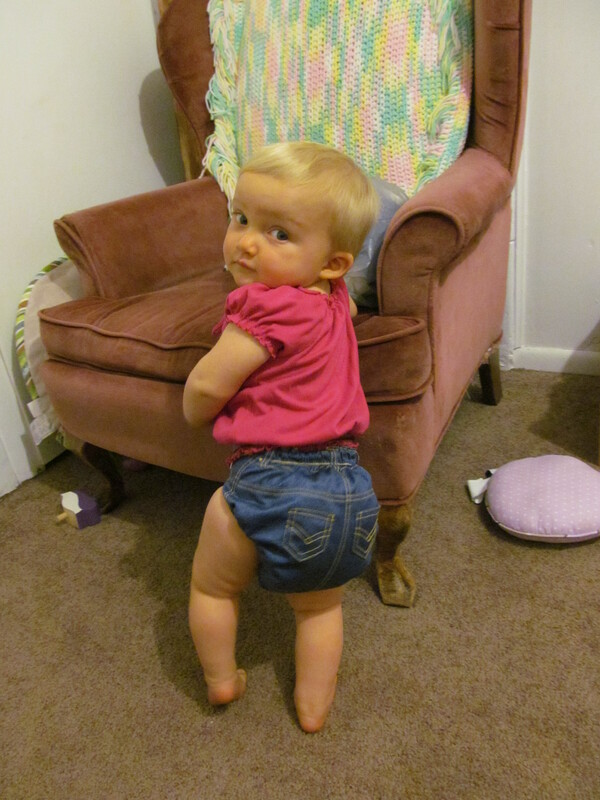 Here, Grace models a cloth diaper with faux pockets and (of course!) functional belt loops. If you’re waiting for the picture of her wearing a cloth diaper complete with an actual belt threaded through the loops, you may want to pack a lunch. It’s going to be a long while, plus another longer while. Below, she’s sporting the appropriate attire to go check gates (or put out salt, or something like that) on the ranch with Daddy. Hoodie by Adidas, pants courtesy of hand me downs from a friend, custom handmade booties by Jean Copeland of Grenada, California. Thanks, Jean! Don’t let the innocent look fool you. She can be a terror. A screaming, crying, throwing herself on the floor little…angel. Pictures like this are what remind me of that when she’s trying to climb on the kitchen counter and rip up the road atlas. This is what happens when daddies are allowed to actively participate in their child’s upbringing. 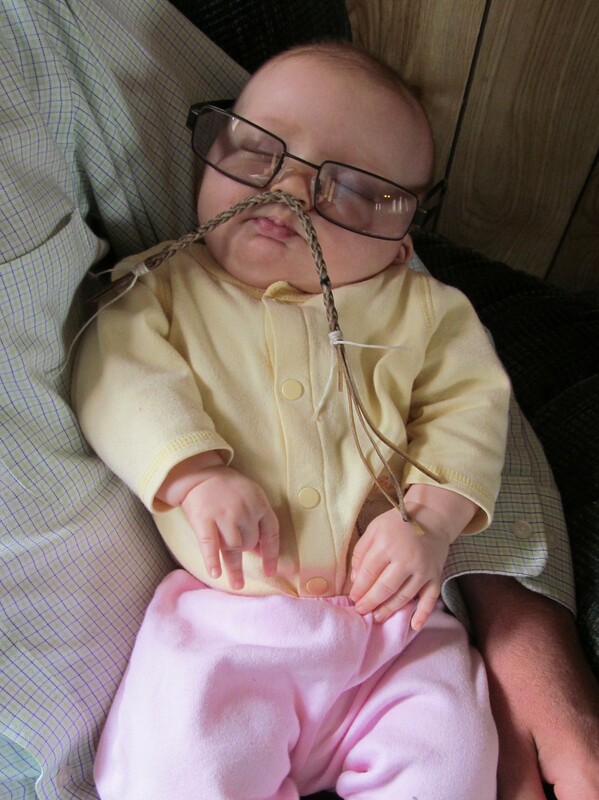 Glasses by Speedy Specs, onesie and bottoms from hand me downs, mustache by our in-house rawhider. What mother doesn’t dream of the day she will describe her newborn daughter’s mustache? I’m a lucky woman. This is an image straight out of Daddy Daycare. 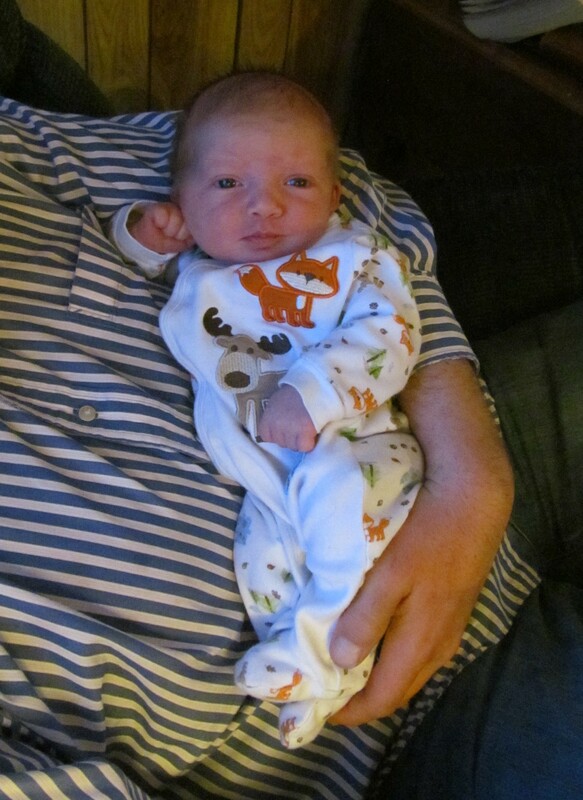 “She wore an itsy-bitsy, teeny-weeny/Yellow polka-dot…onesie.” Isn’t that how the song goes? Here, 3-week-old baby Grace shows off her stylish sleeper, cozy/self-protective mittens and the dark hair she was born with. 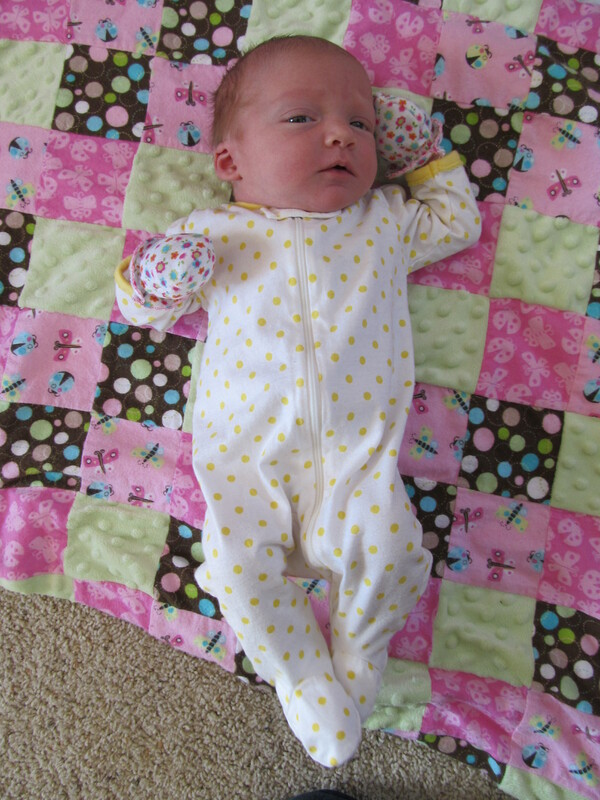 She is laying on a handmade baby blanket made especially for her by Grandma Denise, who picked out each bolt of fabric, cut each one into small squares, then painstakingly sewed them together in a carefully planned patchwork design. She had an early knack for modeling. This was our first inkling at Grace’s future runway career. Nestled in the crook of her daddy’s arm, she gives the camera a pouty face while looking haughty yet relaxed with her crossed ankles and casual sleeper. This was just before most of her hair fell out.